new custom Brand "Heavy Magic Soulfilled Sound Machines™." 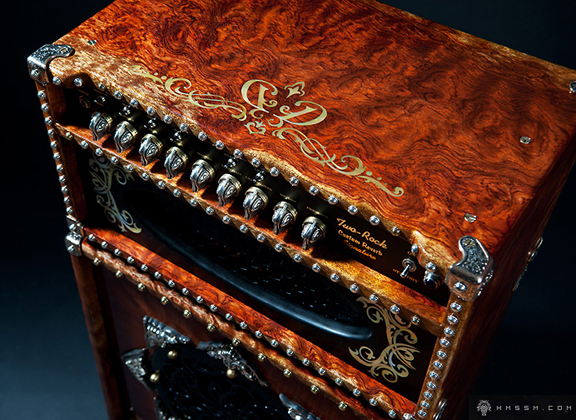 Ultra-fine handcrafted Amplifier & Speaker Cabinet design. was made from the finest materials available. All of the woods were hand selected for their their beauty and exceptional tonal qualities. Hard maple and black walnut have long been admired for the clarity and brilliance of their tone. Bubinga is being selected for use in more musical instruments and fine cabinetry recently and recognized as being, if anything, even harder than maple with a clear, warm tone. Two-Rock Custom Signature Reverb v1™ head, and an Austin Speaker Works 12” 8 ohm "Alnico Elegante™" speaker.